This recipe for gluten free Thai Pork and Vegetable Curry is from northern Thailand. Thai curry dishes vary throughout the country highlighting regional preferences and in the north they prefer thinner curries made without coconut milk. If you are not familiar with curry there is a whole new culinary world waiting for you to explore. From Vindaloo in India to Rendang in Indonesia, many countries have popular curry dishes. These highlight the unique interpretations of how to use the collection of spices simply called curry. Japan, Malaysia, China and Britain all have curry dishes used in vastly different ways. Authentic Thai curries are generally very hot. In this recipe the heat comes from chiles, curry paste and pepper. 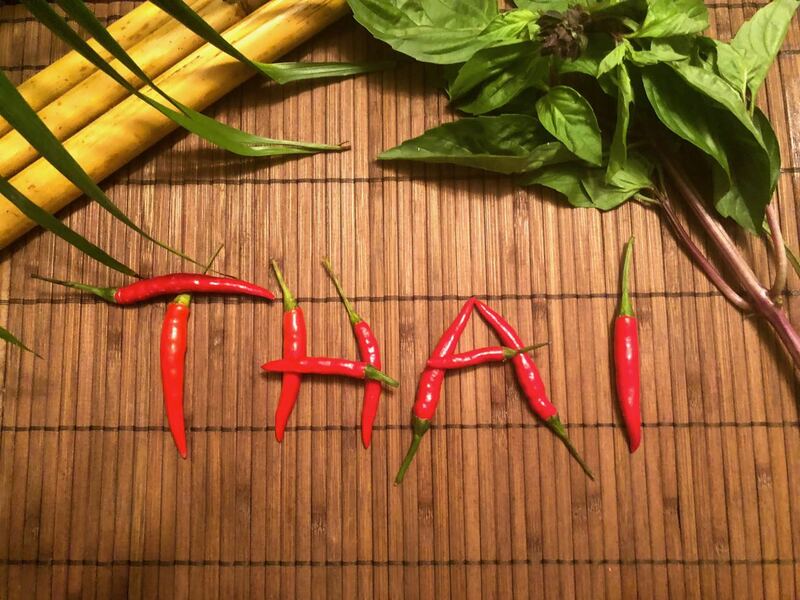 As a general rule the tiny Thai bird chile is about four times as hot as a serrano chile. Thai bird chiles red in colour and are available fresh in Asian markets. They can be frozen if you end up with more than you need. If you can’t find them use serrano or jalapeno chiles and adjust to your liking. If you are worried about the heat you can decrease the amount of curry paste, chile and black pepper. Start with the lower amount of curry paste in the recipe then adjust the amount of chile and pepper. This recipe is a sharp contrast to my creamy, coconut Yellow Chicken Curry so serving these two curries together is a nice comparison of the difference between each of the many Thai curries. To make a menu worthy of a Gourmet Dinner Club evening serve this Cucumber Carrot Salad with plenty of Thai Jasmine coconut rice. End the evening with gluten-free dairy-free coconut ice cream and you have yourself a memorable meal. Blanch the broccoli and green beans in a large saucepan of boiling water for 2 minutes. Drain, rinse under cold running water and set aside. Set wok over medium-high heat and add oil. When hot but not smoking, add the curry paste and cook, stirring constantly, until the paste darkens and the sharp odour mellows, about 3 minutes. Stir in the pork, fish sauce, lime zest and shredded ginger and stir-fry for 5 minutes. Add the mushrooms, broccoli and beans to the work. Stir-fry for 5 minutes longer. Stir in the serrano peppers and tomatoes and fry for 1 minute. Stir in the tamarind, sugar, pepper and salt. Transfer the curry to a serving dish and sprinkle with mint leaves.